When the former urbanized talented group II Far Gone went their separate ways, DaMasta continued to follow his vision as a solo artist. He has currently released his third solo album HATRED:Lyrical Therapy after a short heist since dropping Curse of the 7. A history of aggression and the relief of frustration in his lyrical content compliment the tracks, demonstrating that he has creative and articulate rhyme styles. This albumproves to be one of DaMasta’s best albums yet, as it features Kankakee, Illness (Illinois) long high school poet friend Tara Betts (author of ARC & Hue…featured on HBO’s Def Poetry Jam) and Wild Bill. The album includes production from varies producers such as Unkahmn, DJ-2183, DJ Chrisby, DJ Snow, P.I.G. (Hood Squad Ent.) and DaMasta himself, along with a hand full of amazing up-and-coming talent. HATRED: Lyrical Therapy wins over all hip-hop lovers, with true hip-hop productions at its essence. “Shoes-N-Socks” and “What-u-Smokin” signifies the genre of hip-hop and its culture, battling emcees, sarcastically…which could be debatable as the 7th Element of Hip Hop. “Let It Go,” acts as a therapeutic remedy for facing conscious issues inside, representing hope and showcasing music’s purity at its best. DaMasta delivers unique expressions and potent concepts as he slows down and speeds up the flow to his customized tempo, tongue twisting with an original flow. When it comes to innovative club bangers, “Light It Up,” produced by Kenny (Ken McEastland) is a must add for your playlist and would become remembered as a classic piece in its own right. “Again (Payton’s song)” sets the tone as a dedication to his daughter Payton, signifying that the artist has love in his heart and compassion for others. 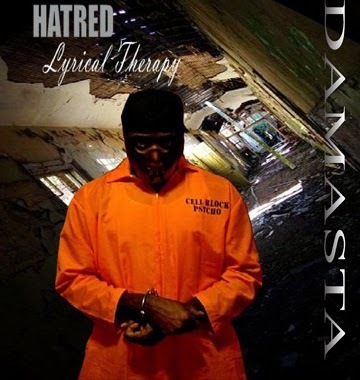 With HATRED: Lyrical Therapy, KRS-One would be proud. DaMasta earns the title that he is a Lyrical Genius…Clever Emcee.